In October we took a trip to NC to demo houses that were destroyed in the hurricane. On June 14-22, we're going back to help get people back in their homes. We'll be doing some basic construction/carpentry/plumbing and need at least one person who has some expertise in that area to lead the rest of us. The cost is $500. 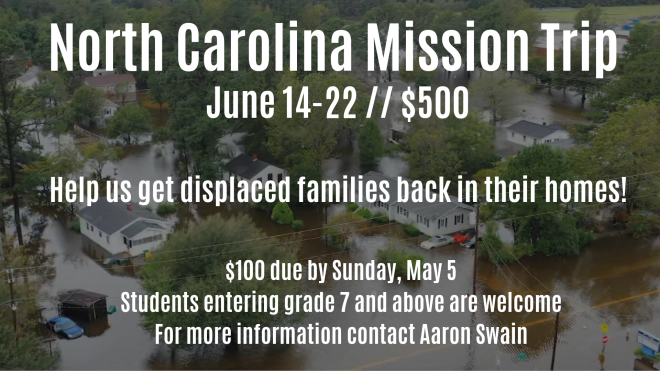 A deposit of $100 is due on Sunday, May 5. The cost of the trip might drop depending on participation. Men, women, and students entering 7th grade and above are welcome. Please be advised that the trip will include and require moderate physical labor in the the summer heat and humidity of NC. Contact pastor Aaron with any questions.